is Chair of the Committee. At the Sainsbury Institute we are very conscious of how important it is to maintain regular links with our research networks in Japan. Even in this digital age of Skype, Facebook and email, by far the most effective way to do this is to make personal visits. For the past few years this has taken me to Japan several times each year. I made my most recent such visit in May. As usual I tried to maximise my time in Japan. This trip took me from Tokyo for the annual meeting of the Japanese Archaeological Association, to the heart of the land of the Flame pots, Nagaoka in Niigata prefecture. And then on to the shores of the Sea of Okhotsk in northern Hokkaido and on to the Genkai Sea that separates Kyushu from the East Asian continent. As is also usual, during my stay I met with many old friends and acquaintances, and met many new faces. I always return from these trips with a box of newly received meishi, the name cards so central to effectively operating in Japan, full of important details about new contacts, and updates for people I already know. April is when the new fiscal year starts in Japan like in the UK, and also the time when people move from one role to another. It is essential to keep up as job titles and addresses change frequently in Japan where people tend to move up more in the same organisation and are sent to one branch to another within the same institution. 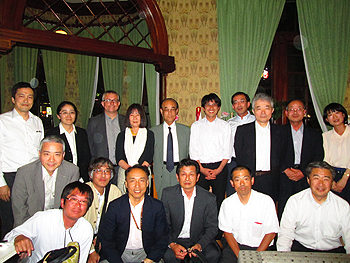 I have been a member of the Japanese Archaeological Association since foreigners were first admitted back in the early 1990s. One of the great pleasures of attending their annual meeting, at which several thousand gather, is perusing the huge number of books and publications on display during the second day of the meetings, usually in the main hall of whichever university is hosting the conference, while meeting friends and catching up on the latest news. I had two specific tasks this time: helping promote the new English language Japanese Journal of Archaeology – freely available to all online at http://www.jjarchaeology.jp/, which I co-edit with Professor Mizoguchi Koji from Kyushu University; and bringing to the attention of the Japanese archaeological world our new Online Resource for Japanese Archaeology Cultural Heritage (http://www.orjach.org) designed to introduce some of the pleasures of Japan’s past to new generations of English-speaking students around the world. Nakamura Oki, one of our former Handa Archaeology Fellows, has been working on the content, and the resource will go live in September. It is twenty years since I visited northern Hokkaido. Disembarking at Memanbetsu airport after my early morning flight from Tokyo, I was met by my two hosts, Dr Kumaki Toshiaki and Dr Kunikita Dai, from the nearby Tokoro Research Station, which has been the base of operations for over half a century of research by archaeologists at Tokyo University on the huge settlements of the Satsumon and Okhotsk cultures to be found in this area. These cultures are the precursors of the Ainu, now recognised by UNESCO as an officially designated Indigenous People. The Satsumon culture (AD 600-1200) grew out of what is known as the Epi-Jomon (300 BC – 600 AD), which flourished in Hokkaido while rice farming was spreading through the rest of Japan. The Okhotsk culture (AD 700-1200) was created by specialised maritime hunting communities who lived around the coasts of northern Hokkaido and the neighbouring islands of Sakhalin, as far as the coast of the Russian Far East. Over the next two days we saw four museums and many archaeological sites, including one of the bluff overlooking the Sea of Okhotsk itself, which where a dwelling pit will be the focus of fieldwork this summer. This area is now inhabited mainly by fishermen who gather the delicious scallops that take years to grow in the clear, cold waters, and the largest town on the coast, Abashiri, is mainly famous for Japan’s high security prison, now partly a museum. But in antiquity, Tokoro was the location of an enormous settlement nestling among the sand-dunes: the traces of over 2500 dwelling pits have been recorded by the archaeologists from Tokyo University, testimony to the thriving exchanges that linked Hokkaido to northern Honshu and further north, to Sakhalin, the Kuriles and the Russian Far East, with the Satsumon, Okhotsk and Ainu cultures central to this ‘northern cultural zone’ prior to colonisation by Japan in the 19th century. 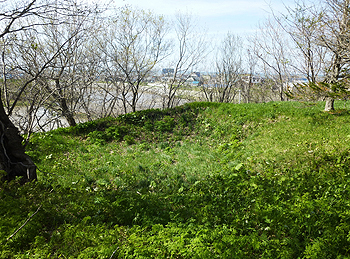 with an as yet unexcavated dwelling pit in the foreground. Sainsbury Institute was invited by the Dean of the Faculty of Letters at Tokyo University to work with colleagues from the Department of Archaeology, including my two hosts in Tokoro, to develop a new Summer Programme in Japanese archaeology and cultural heritage, to be lead this year by our Academic Associate and Lecturer in Japanese Artistic Heritage at UEA, Dr Matsuda Akira. Five lucky students from the UK and other European countries will join five of their Japanese counterparts for a two-week introduction to the field based in Tokyo and Hokkaido. We were all delighted if somewhat overwhelmed by the enormous response attracted by our call for participants in this programme, with a large number of high quality applications from all around the world demonstrating the high levels of interest in Japanese archaeology and cultural heritage. Another two hour flight, and I arrived at the other end of Japan to take part in one of an ongoing series of meetings relating to the bid by the sacred island of Okinoshima and sites associated with the Munakata cult to become a UNESCO World Heritage Site. I have been attending these meetings since 2010 as a member of their overseas expert panel. Nice though it was to be invited to be part of this project, I was certainly no expert on the period from the 4th to the 9th centuries AD, during which all sorts of treasures were deposited on this tiny speck in the Genkai Sea, in attempts to curry favour with the three female Munakata deities and ensure safe crossings to the continent. Asked to write two long reports setting Okinoshima in the context of current research on the archaeology of religion and comparable sites around the world (reading for which took me from the royal burial mounds of Sutton Hoo in East Anglia to the sacred groves of West Africa, and the archaeology of state formation in East Asia to isolated monastic sites off the Irish coast), I now have a much better appreciation of the significance of this beautiful corner of Japan. It turns out that Yoshitake Rie, who in her role as Sake Samurai, just before my departure introduced Friends of the Sainsbury Institute to the wonders of Japanese rice wine, sake, hailed from Munakata. We enjoyed an unforgettable evening at her family ryokan, in the company of the Deputy Chief Priest of the Munakata Grand Shrine, Mr Ashizu Takayuki, after watching the sun go down over the Genkai Sea from their terrace while sipping sparkling sake. At the start of this visit I spent a couple of days in Nagaoka where I have been working for over a decade under the auspices of our Senior Advisor for archaeology, Professor Kobayashi Tatsuo, with colleagues from Nagaoka on a project researching the development of historic landscapes along the Shinano River. Mizutori Mami, our Executive Director at the Sainsbury Institute was with me, and we had a number of meetings which included discussions of how Japan will celebrate its culture in the lead-up to the 2020 Olympics in Tokyo. Niigata is famous for its 5000 year-old Flame pots, and a plan has been hatched to have the Olympic seikadai or cauldron, in a shape inspired by these Flame pots, the culmination of an archaeological and cultural Olympiad, during which Japanese archaeology will be presented to the world. Even the Commissioner of the august Agency for Cultural Affairs is interested, we heard. It would be wonderful if Sainsbury Institute, through the kinds of initiatives touched on above, can play even just a small part in this, repaying some of the kindness, warmth and hospitality received on this and every trip I make to Japan.